Beikhokhei and Siam scored a brace each as Bengaluru Football Club ran out 6-1 winners over MEG in a BDFA Super Division game at the Bangalore Football Stadium, in Bengaluru, on Wednesday. Kim Song Yong and Alwyn George scored the other goals for the Blues, who have now won all three games in the Division, scoring 18 goals in total. Ashley Westwood handed starts to Hanghal and Malsawmzuala as CK Vineeth and Beikhokhei were rested. And it didn’t take long for the Blues to take the lead with Kim unleashing a peach of a strike from over 25 yards out, leaving ’keeper Amith wrong footed in the MEG goal. 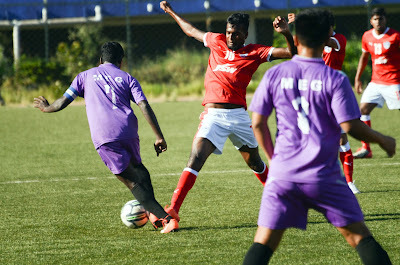 Bengaluru’s second came in similar fashion when, after exchanging passes with Nishu Kumar, Alwyn George curled one in for Hanghal to direct home past Amith. The midfielder scored his second in the 40th minute when he lobbed home from a tight angle after a quick one-two with Udanta to make it 3-0. With a comfortable lead going into the break, the gaffer rung in two changes, sending on Keegan Pereira and Beikhokhei in place of Nishu and Kim. It didn’t take long for the Blues to extend their lead with Alwyn scoring his second of the day, tapping home Rino Anto’s cross from close range. Beikhokhei peeled off the MEG defense to meet Udanta’s cut back and get his name on the scoresheet for the second time as a substitute in the tournament to make it 5-0, before scoring another with a lobbed finish past Amith. MEG claimed a consolation goal in the dying moments of the game when skipper Ajiraj K’s perfectly placed free-kick found the net off the crossbar beyond a hapless Srijit S. in the Blues goal. Bengaluru next face Students Union on Monday.